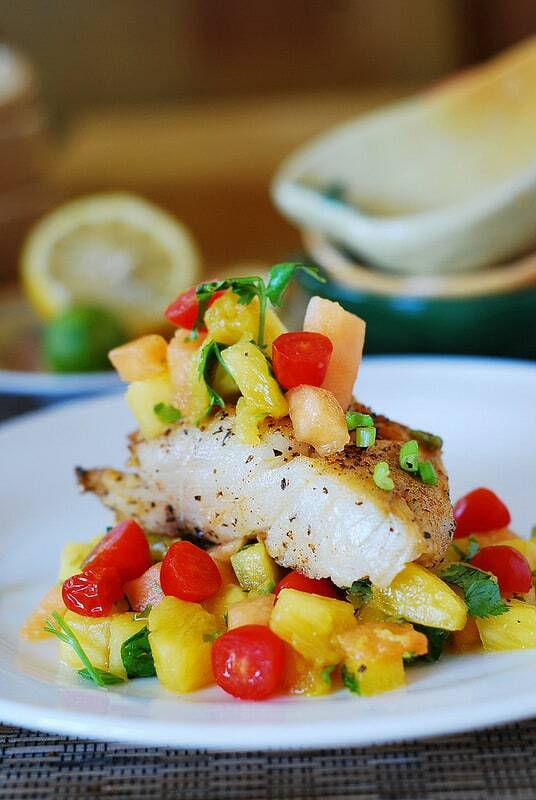 Pan-Seared Black Cod with Tropical Fruit Salsa – healthy, delicious, Mediterranean-style recipe. Tropical Fruit Salsa is made with cantaloupe, tomatoes, pineapple, red onion, cilantro, lime juice, and spices. 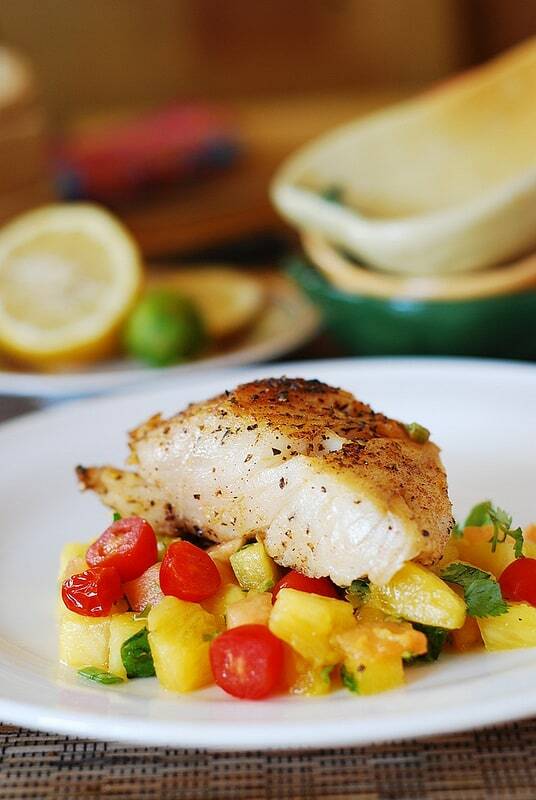 Instead of black cod, use any white fish: tilapia, halibut, mahi mahi, sea bass. I’ve been making a lot of tropical fruit salsa lately. You could say I am on a tropical fruit salsa kick. Fruits and veggies mixed with the lime juice and spices are so good, and there are so many possible variations – I can eat it with anything! 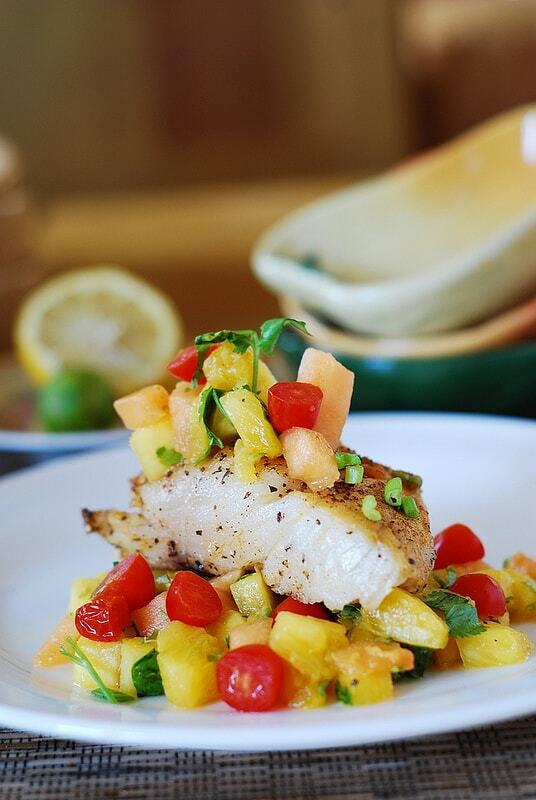 The salsa goes especially well with seafood: I’ve made mango salsa with salmon, pineapple salsa with shrimp, and now it’s time for Pan-Seared Black Cod with Tropical Fruit Salsa. In this recipe, I am entering a new fruit – cantaloupe! Who knew that cantaloupe could be a delicious addition to tropical fruit salsa! It’s sweet, it’s soft, it’s colorful! It balances perfectly with the rest of ingredients: tomatoes, pineapple, red onion, cilantro, lime juice, and spices. On these photos you see fresh black cod right from the Seattle seafood market, but, really, any white fish can be used: tilapia, halibut, mahi mahi, sea bass. I found that they all go great with tropical fruit salsa! Black cod that I used in this recipe is an exceptionally flavorful and very buttery fish – it’s very easy to pan sear it due to its high oil content, therefore, it’s almost impossible to have a dry black cod. If you get your hands on good quality black cod – by all means buy it! If you tend to overcook your fish and then don’t like the resulting dry taste – try this fish, because it’s virtually impossible to fail with black cod and overcook it. It’s perfect for pan-searing! 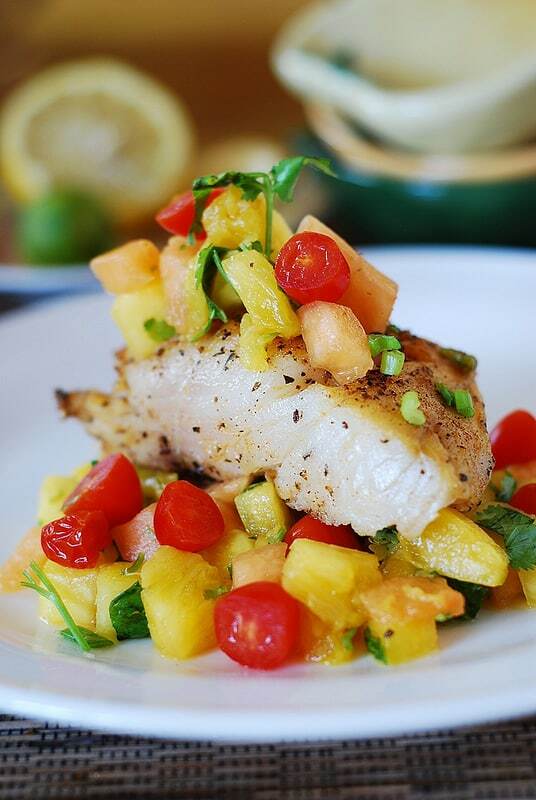 I just love this Pan-Seared Black Cod with Tropical Fruit Salsa! Eating white, flaky fish with all that fruit and vegetables is very refreshing! I feel like I am in Hawaii! 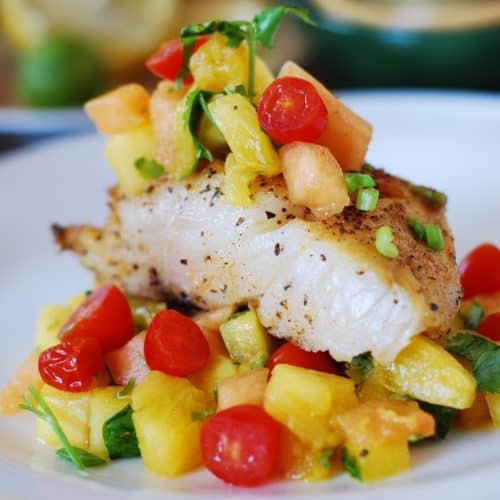 Pan-Seared Black Cod with Tropical Fruit Salsa - healthy, delicious, Mediterranean or Italian style recipe. Or, it's like something you eat in Hawaii. Fruit Salsa is made with cantaloupe, tomatoes, pineapple, red onion, cilantro, lime juice, and spices. Instead of black cod, use any white fish: tilapia, halibut, mahi mahi, sea bass. Mix all chopped ingredients for tropical fruit salsa in a large bowl, add lime juice, add salt and pepper to taste. Set aside to let the juices combine together. To prepare seasoning for the fish, mix salt, pepper, paprika, oregano, cumin in a small bowl. Heat large skillet on high heat. Season fish on non-skin side with salt & pepper and other spices from step 2, generously. Add oil to the hot skillet: the oil should sizzle. Add fish to the skillet non-skin side down (skin side up) and sear for 4 minutes, moving the fish around the skillet to make sure oil coats the surface of the fish and that the fish is not sticking to the pan while searing. After these 4 minutes, turn the fish over to the skin side and sear for another 3 minutes on high heat. After searing on the skin side, you can actually remove salmon skin easily at this point and discard, if you don’t like to eat it. I’m confused, your recipe says skin side up, cod doesn’t have skin. It also refers to salmon skin.